The town of Milford has a population of 3,007 partially engaged in ship-building. It is pleasantly situated; but since the removal of the royal dockyard and Irish packet station from here, about 1815, to Pater and Pembroke, on the opposite side of the Haven, its importance in a commercial point of view has much declined. Milford is prettily situated on a sloping point of land, about six miles from the entrance of the Haven, to which it gives its name. Milford Haven ought to be viewed from the water. 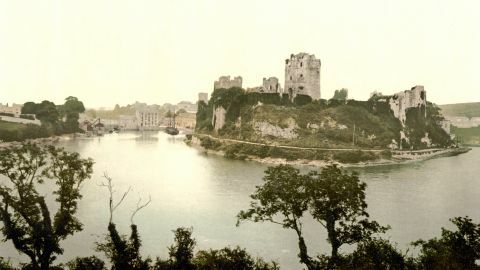 The lower and broadest portion of the Haven runs in an easterly direction for about twelve miles, and then turns abruptly to the north, forming several reaches towards Haverfordwest. The scenery around Milford is very picturesque. Oh for a horse with wings! Hear’st thou, Pisanio? Glide thither in a day ? To inherit such a haven! Here, in “a mountainous country, with a cave,” disguised as a boy, the poor betrayed lady afterwards meets with her royal brothers Guiderus and Arviragus, supposed to be sons of the old shepherd Belarius. Bel. This youth, howe’er distressed he appears, bath had Good ancestors. Arv. How angel like he sings. You here at Milford Haven, with your ships. During the troubles of Henry IV’s reign, a force of 12,000 French actually landed here to support the rising of Owen Glyndwr. The peninsula between Milford Haven and the Bristol Channel is bounded by a remarkable broken limestone coast, along which is a succession of the most, striking views. When traversed from end to end, it is a walk, from Angle Bay, at the Haven’s mouth, to Tenby in Carmarthen bay, of 20 or 25 miles. Cars may be hired, but, as inns are very rare, it is advisable to take provisions, or you must trust to the chance of shelter at some hospitably farmhouse. Of these, however, there are but few. Starting from the old fort near Angle or Nangle Bay, you pass round the east side of the entrance to the Haven, with St. Anne’s Head and Light on the opposite side, and the island closing up St. Bride’s Bay, a most enchanting spot, in the distance behind. Rat and Sheep Islands arc seen below, the latter near a Danish camp. The broad swell of the Atlantic dashes on the cliffs. At Gupton (seven miles from Angle fort) a little, stream comes down to Freshwater Bay, from Castle Martin, an old place, noted for its breed of black hill cattle, and for a cromlech. It had a castle formerly. Brownslade, near it, is the seat of J. Mirehouse, Esq. At Linney Head (three miles from Gupton) the finest part of this coast trip commences. 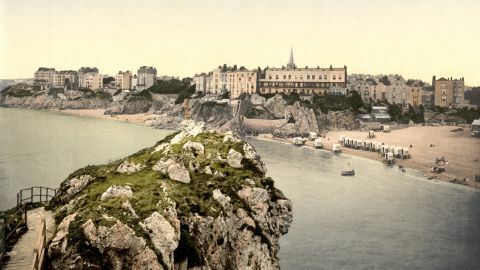 “A greater extent of carboniferous limestone is exposed to view along: these shores than in any part of Britain.” – Cliffe’s Book of South Wales . Keep at the edge of the downs to enjoy it thoroughly. Out in the sea is the Crow rock, a dangerous one, covered at high water. The Castles are two rocks separated from the mainland. Then Flimstone chapel (a ruin); near Bull-Slaughter Bay another group of stacks or castle rocks, swarming with razorbills, guillemots, kittiwakes, and other sea birds, in a very wild part; another camp near a dark chasm, called the Devil’s Cauldron; and then St. Gwan’s Head (seven miles from Linney Head), so called, it is said, after King Arthur’s nephew, Sir Gawaine, or Gwain, of old romances. Here the cliffs are 160 or 170 feet high, and the strata in vast horizontal blocks. In a gap looking down to the sea, is a ruined hermitage, to which you descend by about 53 broken steps; it is only 20 feet long. The saint’s hiding place in the east wall, and his well are shown, with remnants of past superstition. Bosherston Meer, a little further, is a cave, which runs up the land more than a quarter of a mile. The roaring of the waves and the wind along this natural tunnel is at times terrific. Before reaching it you pass a remarkable crack in the cliffs, called the Huntsman’s Leap. Across Broadhaven Creek (which runs up to Bosheston) to Stackpole Head; then Stackpole Park, the modern seat of the Earl of Cawdor, the chief owner of the soil in this quarter. There was a Norman castle of the 11th century here, built by a baron, whose effigy is in Client on church, Fine view from Windmill Hill. Round East Freshwater Bay and Swanslake Bay to Manorbeer Castle (8 miles from West Gwan’s) close to the shore. It is a fine existing specimen of what a feudal dwelling was in early times. 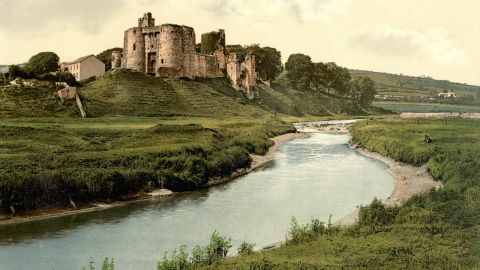 It was built by William de Bam, and was the birth place of Giraldus de Barri (or Cambrensis, i.e., the Welshman): Lord Milford is the present owner. Hence, round Oldcastle Head and Lidstep Point, to Giltar Point (15 miles from Manor Bay), turning into Carmarthen Bay. Caldy Island and its lighthouse, about two miles off, divided from the mainland by Caldy Sound, here about ¾ mile across. About 20 miles to the E.S.E., if the weather is favourable, you may catch sight of the Worm’s Head, on the other side of the bay, a most striking object. Caldy has a chapel and remains of a priory upon it, incorporated with the seat of a gentleman who is lord of the island. At Penally, a pretty chapel and old cross; shells and seaweeds on the shore. Old castle at Trellowyn, and mineral springs at Gumfreston. Then Tenby, 2 or 3 miles from Giltar Point.